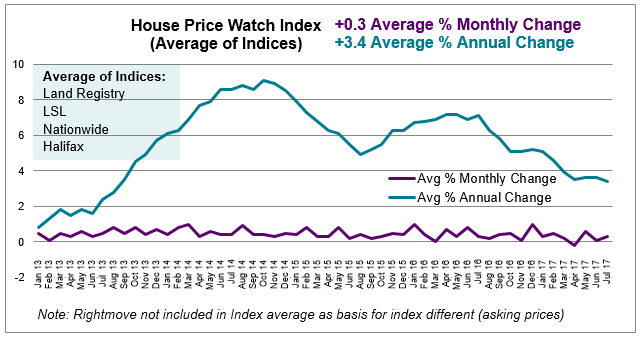 August 2017 House Price Watch indicates that house prices are up on average 0.3% in the past month and up 3.4% in the past year. Most of the major house price indices report a rise in house prices over the past month. Land Registry (0.8%), Halifax (0.4%), Nationwide (0.3%) and Rightmove (0.1%) show an increase in monthly house prices. LSL notes a decline (-0.2%). 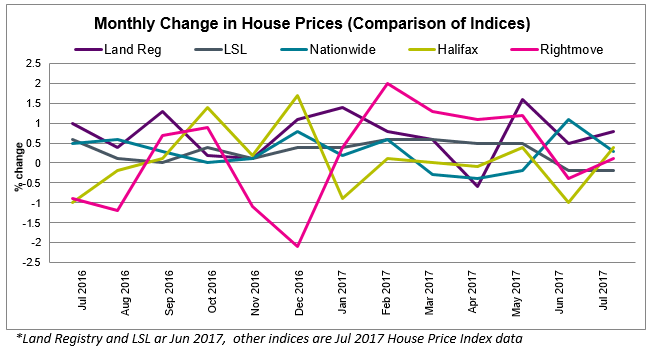 Land Registry and LSL are reporting June house price data, while other indices are reporting July figures. Transactions in the first half of 2017 are down 6% versus the same period in 2016. 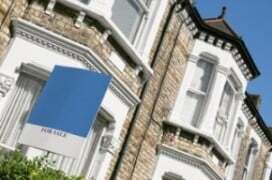 UK home sales fell to 96,910 in June; a 3.3% decrease between May and June. Transactions have fallen each month since March of this year. 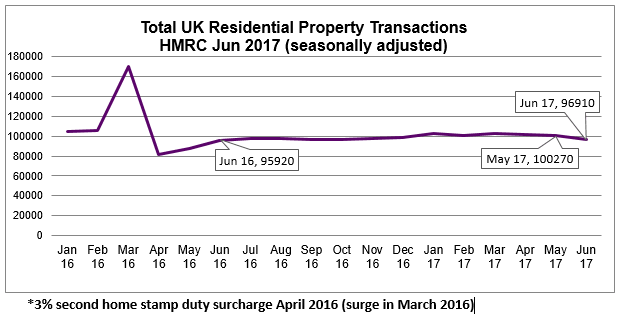 (HMRC seasonally adjusted figures). A continued shortage of homes available for sale is putting upward pressure on house prices. The June RICS UK Residential Market Survey reports that agreed sales have declined as have new buyer enquiries and new instructions. Average stock levels on estate agents’ books have declined for the 16th consecutive month leaving the homes available for sale on estate agents’ books at an all-time low. A review of asking prices achieved in the first half of 2017 shows price sensitivity from buyers, particularly at the top-end of the market. Analysis of data from HomeOwners Alliance estateagent4me tool shows that agents at the top end of the property market are selling properties for an average of £260,000 below their asking price. The figures show that agents who deal with houses with an average value above £2m are having to offer around 9% off the asking price before they sell. The data, based on estate agent performance during the first half of 2017, shows properties in the £1.75m – £2m bracket are seeing average discounts of around 12% and those priced between £1.5m and £1.75m are being marked down by 9%. These equate to average ‘discounts’ of £224,000 and £149,000 respectively. At the lower end of the market, houses are also selling for under their asking price, but reductions are much more modest. Agents dealing with properties that on average sell within the £100k – £125k bracket are selling for around 6% under their asking price – a discount of just under £7,000. In the middle range (£200,000 – £500,000) discounts are at their smallest, with the average reduction on the asking price only around 3%. This means a typical property listed on the market at £300,000 would be likely to sell for around £291,000, a reduction of just £9,000. “It is fascinating to see the difference in how the property market is performing at different levels and across the country. The key takeout is that there are significant reductions at the top end of the market where the market is very slow, while at more affordable levels, the market seems to be functioning fairly normally. Gone are the days of bidding wars for luxury properties, now it would seem that the lower the value of a property, the quicker it sells. 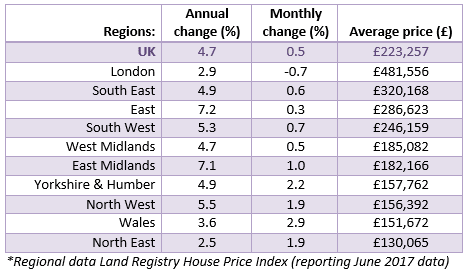 House prices are up in most parts of the country in the past month with the exception of London (-0.7%). The East of England (7.2%) and the East Midlands (7.1%) have the highest rates of annual house price growth, while the slowest rates of annual house price growth are evident in the North East (2.5%) and London (2.9%). Other regions are experiencing annual house price growth in the range of 3.6% – 5.5% with less disparity in rates of regional house price growth than we have seen in recent years.